Ana Mantica is the Editorial Officer at the Foundation. In this role, Ana manages the Foundation’s editorial and written content, including social media sites, website, blog, emails and newsletters. 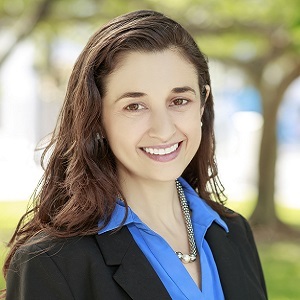 Prior to joining the Foundation, Ana worked in development and stewardship communications for the University of Miami’s Division of University Advancement. She brings experience in marketing and social media from Vera Bradley and their breast cancer research foundation in Fort Wayne, IN. Ana’s editorial experience includes serving as an editor at SELF and Prevention in New York City, and as a contributor to numerous local and national publications and outlets. A native Miamian, Ana attended Epiphany School and Our Lady of Lourdes Academy. She earned her bachelor’s and master’s degrees in journalism from Northwestern University’s Medill School of Journalism and holds her M.S.Ed. in school counseling from Indiana University and completed the University of Miami’s community and social change program. An active member of the community, Ana participated in the Greater Miami Chamber of Commerce’s Leadership Miami program and the Neighborhood Housing Services of South Florida leadership institute. She volunteers as a mentor with Big Brothers Big Sisters of Greater Miami and Women of Tomorrow. In 2016, MCCJ recognized her with the Silver Medallion Student Award.